Firehouse Barbeque has been at this location since at least 1965. That was the summer I was sitting on the front lawn of the Park Motel across the highway watching the smoke coming out of the building. I didn't think much about it because it is a barbeque joint. Then the fire trucks showed up and started fighting the fire. At the time I thought it was funny that a place call "Firehouse" almost burned to the ground. 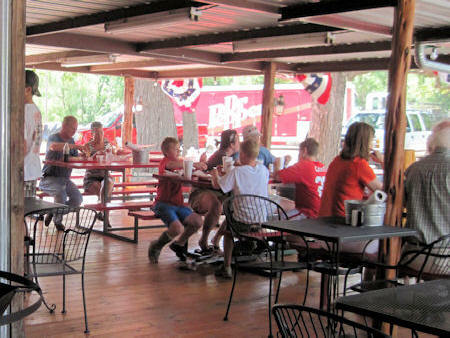 I drove by Memorial weekend (2011) and the Firehouse BBQ is still in operation, although I think it has a different owner than in 1965. We decide to give it a try. We had to stand in line outside to get in and get our food. It were as if the servers were brought in off the bench. They were very nice but seemed to be in a state of confusion as to how to get each task done. When we finally got in, I ordered a two meat plate. I ordered brisket, jalapeño sausage jalapeño potato salad and green beans as side dishes with a stuffed jalapeño pepper for good measure. I also got some peach cobbler and they told me that when I was ready they would bring me some ice cream to go with it. Was is it good barbeque? Yes it was but, there is a lot of variations in barbeque. 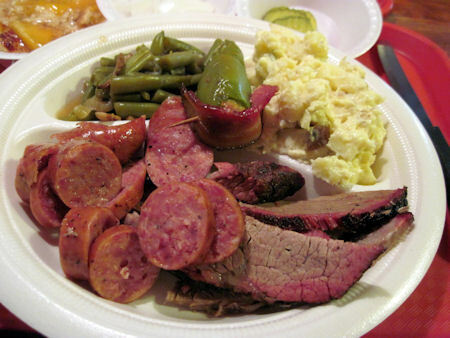 This barbeque is not the same as you find in Lockhart which is not the same as you find in Llano etc. The barbeque was good and the peach cobbler with ice cream just hit the spot. I washed it down with ice tea. We had enough left to have some for supper. So we enjoyed it again.